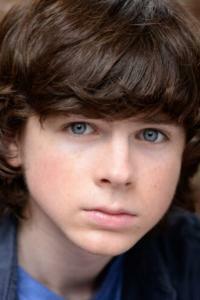 Chandler Carlton Riggs is an American child actor who was born on June 27, 1999 in Atlanta, Georgia, USA. He was born to parents William Riggs and Gina Ann Riggs and has a little brother. He is best known for his role as Carl Grimes on the AMC television series The Walking Dead. He started working for The Walking Dead at the age of ten. He loves to organize a fan meeting every year and his favorite movie is The Mist (2007). He is 5' 4" (1.63 m) and his nickname is ChairHandler. He is also known for his parts in Get Low (2009) and Jesus H. Zombie (2006). Chandler is an amazing actor on The Walking Dead series and it is great to watch him evolve into the great kids actor he is today. Chandler Riggs goes to public school like regular kids and finished 9th grade on May 28, 2014 at Etwoah High School in Woodstock, Georgia. He was nominated for the Young Artist Award for Best Leading Young Actor in 2012 and 2013 for his role on The Walking Dead. Riggs won 2 Satellite Awards in 2012 and 2013 for Best Cast - Television Series and Best Performance by a Younger Actor in a Television Series for The Walking Dead series.